"The Best of all Mothers"
Reproduction is a key factor in any organism's survival. By studying how organisms reproduce, the conditions under which reproduction happens, and the behaviors involved in reproduction, many questions about Maiasaura peeblesorum can be answered. It is believed that Maiasaura strictly regulated reproduction between only herd members. Based on fossils found together and separate, it has also been surmised that juveniles and sub-adults/adults did not spend time or mate with each other (Horner et.al., 1993). Also, since reproduction was limited to inter-herd reproduction and since Maiasaura were known to travel in herd up to 10,000 individuals, genetic drift would not have been an issue for this species. Based on the discovery of Egg Mountain, we already know that Maiasaura was an extremely social animal that laid its eggs in a mass nurseries. 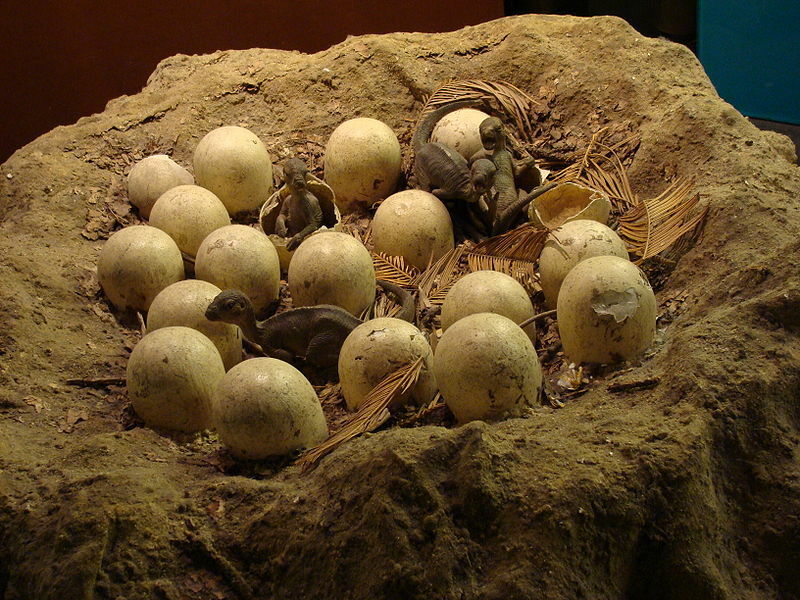 Maiasaura’s reproduction was seasonal, and more than one clutch of eggs each year is suspected (Griebeler et.al., 2013). There are varying hypotheses as to how many eggs were laid each year (rocketing into estimations of 850 a year) but the current and most reasonable answer seems to be around 200 eggs a year (Griebeler et.al., 2013). 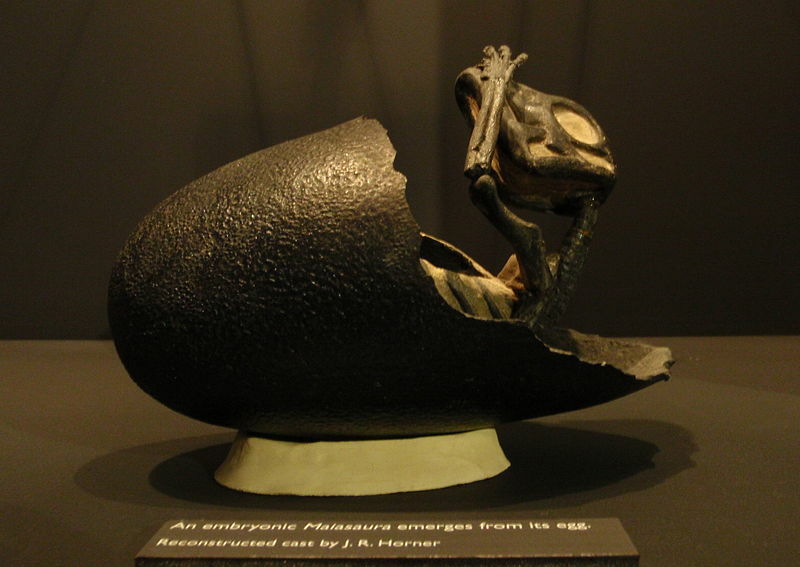 Maiasaura’s breeding was also affected by heard dynamics. Since a hierarchical system is believed to have been part of herd life, it also could have had effects which organisms were allowed to reproduce and on breeding partners (Horner 2000). Laying multiple egg clutches each breeding season would make sense for an organism l ike Maiasaura, an organism prone to predation. These multiple clutches per year meant that if some were lost to predation there would be a greater chance of other clutches surviving and increasing herd size (Cooper et.al., 2008). This is further supported by the fact that mortality was exceptionally high for juveniles, meaning they needed to have as many offspring as possible to increase the number of organisms that reached breeding age. Mortality severely dropped off when Maiasaura reached full size (Horner et.al., 1993). Sadly, it is hard to know specifics about Maiasaura peeblesorum’s breeding behavior since we only have the fossil record and excavated breeding sites to go off. We do know, however, that these organisms were named the "Good Mother Lizard" for a reason, taking care of their young throughout their nestling stage and possibly even into their juvenile stage. The idea of parents raising their young for long periods of time is often seen in instances where there are few offspring, but since Maiasaura peeblesorum had many offspring each breeding season the idea of raising young for an extended period of time is revolutionary. For more information about where Maiasaura gave birth to their young and where they were discovered visit the Habitat page! Copyright (c) 2014 https://bioweb.uwlax.edu/bio203/s2014/fischbac_sama/. All rights reserved. Design by Free CSS Templates.